Availability of Chrome interoperable VP9 SVC in Janus, a Meetecho / CoSMo collaboration! Following the great article from Sergio Murillo and Gustavo garcia in webrtchacks, the interest had surged about VP9 SVC. CoSMo Software, specialising on libwebrtc modifications for WebRTC clients, has been collaborating with Meetecho, specialising on WebRTC media servers (Janus), across many WebRTC system design projects to date. Both teams are deeply rooted in public Research and believe in Excellence in Technology, and open source projects as a way to differentiate. Together they represent the best WebRTC system level design team of consultants available today. With the recent addition of Sergio Murillo, WebRTC expert author of the above blog post, at the foundation of one of the few WebRTC Media Servers, to the Cosmo team, the opportunity arised to share expertise and collaborate. The Janus implementation is based on Sergio’s C++ code, which was available under a permissive license. Cosmo and Meetecho teams are happy to announce the release of a patch to Janus to support VP9 SVC and layer switching. This is only the first release of several collaborative projects, and improvements brewing, so stay tuned for more! While people love to disagree about all aspects of WebRTC, there is a large consensus that Lorenzo Miniero, chairman of Meetecho, has the best look in the ecosystem. 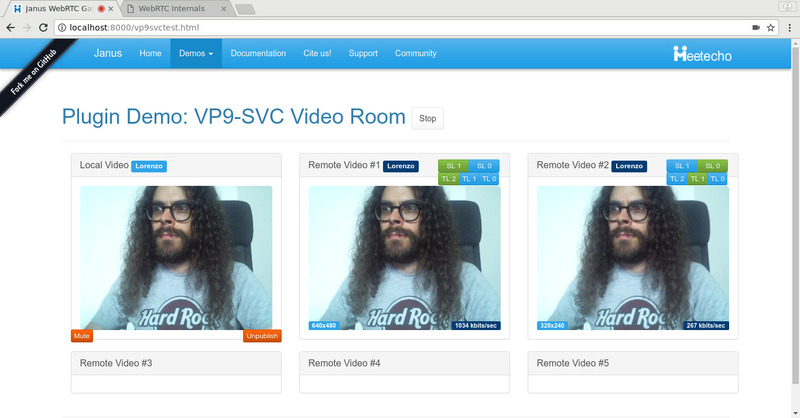 Now, with VP9 SVC, you can enjoy his look in high resolution, for less bandwidth, in a way that can sustain the worse network conditions. Enjoy! (Disclaimer: unlike what is written on the page, you can NOT fork Lorenzo on GitHub. Believe us, we tried). Meetecho was born in 2009 as an official acamedic spin-off of the University of Napoli Federico II. Since Day One they’ve been working hard on real-time multimedia applications over the Internet, ranging from VoIP to more advanced applications based on top of the emerging WebRTC technology. Today’s Meetecho team is composed of world level experts in Real-Time Communication, proud authors of the Janus® WebRTC server! They provide design and implementation consulting services of WebRTC products on top of Janus®, ad-hoc solutions for streaming of live events to the world with remote participation, as well as Ready-to-use web based conferencing and collaboration services. Their website is listing the major companies already trusting them. 10 years ago, a crack student unit was sent to PhD by a European court for WebRTC, a technology they didn’t write. These men promptly graduated from maximum security universities to the Napoli and Singapore Underground. Today, still wanted by their government-paid past teachers, they survive as WebRTC consultants. If you have a WebRTC problem, if no one else can help, and if you can find them, maybe you can hire… the WebRTC A-Team. 1 Comment » for Availability of Chrome interoperable VP9 SVC in Janus, a Meetecho / CoSMo collaboration! Your article is very informative and helpful for me. Thanks for shared with us. 1 Pings/Trackbacks for "Availability of Chrome interoperable VP9 SVC in Janus, a Meetecho / CoSMo collaboration!"